As a breeder of mongolian gerbils and other gerbil species I believe that one of the most important factors when attempting to breed or keep gerbils is to get their micro environment just right. This is especially apparent when breeding gerbils and in preventing stereo typical behaviours. An example of a stereo typical behaviour in gerbils and jirds is digging at the corners of the tank for hours on end in a fruitless attempt at building a burrow. Once this behaviour becomes a repeated pattern, it is known as a stereotypical behaviour. Obviously, it's impossible to create the perfect natural environment for gerbils in a limited space such as a tank, but simple measures can ensure the mental health and well-being of your gerbils. I believe the most important item in a gerbil tank when considering this is their nest box and burrow system. This is the place that gerbils rest, sleep, hide, hoard food and of course, bring up new litters. The artifical burrow system I use is easy to make, extremely hard wearing and safe for gerbils. Gerbils using this burrow system display little signs of stereotypical behaviour and smaller species such as the Gerbillus group readily breed in this more natural environment. Ceramic/Terracotta tiles and tile cutter ~ Standard bathroom/kitchen tiles are ideal. You can vary the size too depending on which species you are making a nestbox for. Large stone floor tiles can be custom cut to house the larger species of jirds and will last a lifetime. P.V.C., metal or bamboo tubing ~ If the nestbox is being designed to be placed inside the tank, use only bamboo or metal tubing. If the nestbox is being designed to sit outside the tank, like in the example below, P.V.C. tubing is fine to use as the gerbil cannot gnaw at it. Make sure the tubing is at least 5cm wide. Apply the aquarium sealant along the bottom edge of the tile and rest against a solid surface. If you notice I'm using the glass tank to ensure that the assembled box stands at a 90 degree angle. Slide the other tile into place so that it bonds with the silicone on the first tile to form a letter 'L' shape. Repeat this process on two more sides surrounding the base tile, smooth the sealant with a wet finger and make sure the sides are bonded with the base and back. You will notice that the base extends slightly to make a lip, this is where the front panel will sit. To make the inner chambers, you need a shelf inside the box, cut this from a tile and use the offcuts to make supports for the shelf. The shelf can be fixed in place with sealant if you wish but I prefer to leave it loose, the gerbils dont move it and it makes cleaning and observation easier. At this stage you can also reinforce the joints inside the nest box by applying more silicon sealant to them. Just smooth it after applying by using a wet finger, or a piece of wet cloth. To make supports for the lid use another tile and cut squares, you will need 4 altogether, use three now and put the other to one side for later use on the front panel. Save the remaider of the tile for the grip on the lid. Fix 3 squares to the upper inner side of the box, use sealant to fix them the depth of the tile from the top edge, this will allow the lid to sit flush inside the box. Do not fix the lid to the supports, you will need to remove it for cleaning and observation. 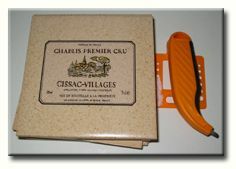 The lid should extend beyond the front of the box - mark this overlap and remove using a tile cutter and pliers. Next we need to extend the burrow with the piping, for this one I have used pvc piping. Use a saw and mitre, cut the piping at 45 degree angles. When you place the two pipes together it should form an 'L' shape. If you are going to use this system for mongolian gerbils its important to make sure that when the 'L' shaped pipe is in place it extends beyond the box front. I chose the 'L' shaped tubing as this cuts down on any light getting into the nest box. The piping for the tunnel needs to be at least 50mm wide. Other and more preferable and permanent alternatives are metal piping, (the only disadvantage to this is the extra weight) and bamboo canes measuring at least 50mm in diameter are ideal if you can obtain them. A good source is florists, or floristry wholesalers. You will need a hole the width of the pipe in the front panel, mark this using the piping and cut out using a tile cutter or tile saw. Fix the pipe to the hole in the front panel, this is best done by placing the tile flat then heavily glueing the pipe in place. Smooth the silicon into place with a wet finger and when dry, trim the excess plastic and silicon from the inner edge of the pipe. Fill in any gaps with the sealant again smoothing it flush with a wet finger. You are ready then to fix the front panel to the box. Start by applying sealant to the three edges. Place the front panel on top of the base lip and glue into place, smooth the silicon with a wet finger. With ceramic tiles the silicon is a very fast grab adhesive and dries quickly. To reinforce the panel add more sealant to the inside edges and again smooth down. When dry trim any excess from the top, this is to make sure the lid sits correctly. 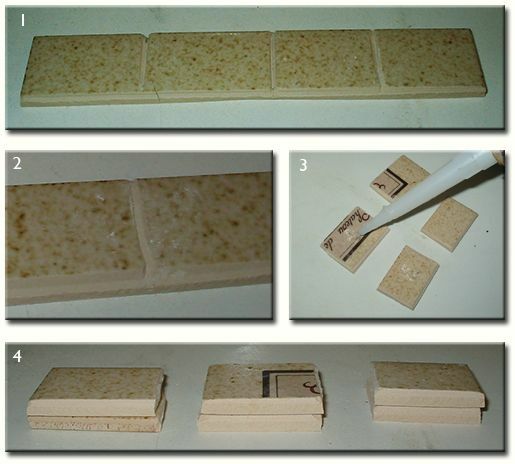 Use the tile offcuts to make a grip for the lid so that access is made easier. Replace the shelf and place the lid in place. Leave to dry for a day or so which gives the silicon time to cure properly. The artificial burrow system is now finished and ready to use. With the above example it was fixed outside a storage bin tank. This artificial burrow system has just been placed inside a tank with Dipodils in, they are already exploring inside and around their new home. You can notice in the second picture that the Dipodils have a food store buried at the front of the tank, I expect this to be moved inside the new burrow very soon. This particular box is used for Gerbillus Species, and has a triangular shelf inside and a small opening at the front for access. This is basically a simpler version of the above model, and without a tunnel attached, and can be made much faster. 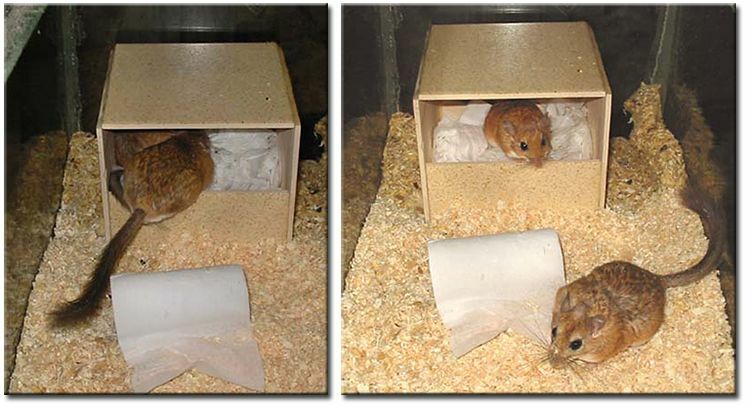 You can see from the second photo that the gerbils are using the top chamber mainly for food storage and that the bottom chamber is packed with bedding. Below is a very simple nestbox, with a hig front lip to prevent any pups escaping the nest. This simple design worked very well for bushy tail jirds.